Todi, town and comune of the Province of Perugia, Umbria in Italy. It is perched on a tall two-breasted hill overlooking the east bank of the Tiber, commanding distant views in every direction and only 20km from Casa Lilla bed and breakfast. According to the legend, said to have been recorded around 1330 BCE by a mythological Quirinus Colonus, Todi was built by Hercules, who here killed Cacus, and gave the city the name of Eclis. 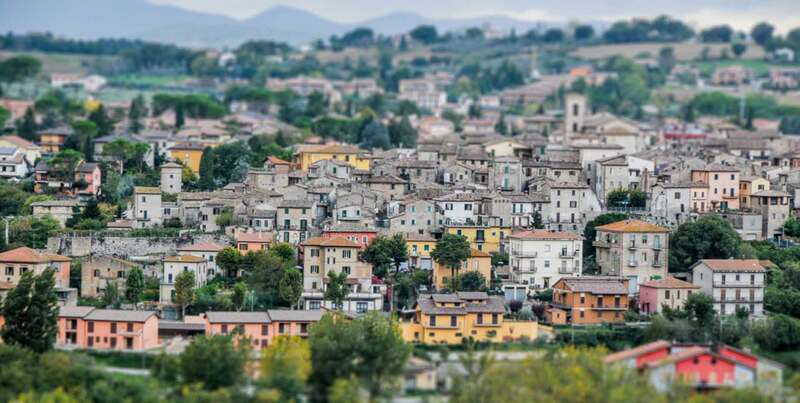 Historical Todi was founded by the ancient Italic people of the Umbri, in the 8th-7th century BCE, with the name of Tutere (Pliny, Naturalis Historia). The name means “border”, being the city located on the frontier with the Etruscan dominions. It probably was still under the latter’s influence when it was conquered by the Romans in 217 BCE. According to Silius Italicus, it had a double line of walls that stopped Hannibal himself after his victory at the Trasimeno. In most Latin texts, the name of the town took the form Tuder. Christianity spread to Todi very early, through the efforts of St. Terentianus. Bishop St. Fortunatus became the patron saint of the city for his heroic defence of it during the Gothic siege. In Lombard times, Todi was part of the Duchy of Spoleto. After the 12th century, the city started to expand again the government was held first by consuls, and then by podestà and a people’s captain, some of whom achieved wide fame. In 1244 the new quarters, housing mainly the new artisan classes, were enclosed in a new circle of walls. In 1290 the city had 40,000 inhabitants. Communal autonomy was lost in 1367 when the city was annexed to the Papal States the local overlordship shifted among various families (the Tomacelli, the Malatesta, Braccio da Montone, Francesco Sforza, etc. Although reduced to half of its former population, Todi lived a brief period of splendour under bishop Angelo Cesi, who rebuilt several edifices or added new ones, like the Cesia Fountain that still bears his name. In July of 1849, Todi received Giuseppe Garibaldi, who was fleeing after the failed democratic attempt of the Republic of Rome. Todi is the birthplace of the Franciscan poet Jacopone da Todi, who is buried in a special crypt in the church of S. Fortunato. Almost all Todi’s main medieval monuments, the Duomo, the Palazzo del Capitano, the Palazzo del Priore and the Palazzo del Popolo, front on the main square on the lower breast of the hill, the piazza is thus one of the most picturesque in Italy and is often used as a movie set. The whole landscape is sited over some huge ancient Roman cisterns, with more than 500 pits, which remained in use until 1925. The Cathedral (11th century) is a striking Gothic edifice on the Lombard plan, said to be erected over an ancient Roman building, probably a temple dedicated to Apollo (here an ancient bronze head, now at the Vatican Museum, was found). The current church was almost totally rebuilt after a fire in 1190. The main feature of the squarish façade is the central great rose-window, added in 1513. Of the same period is the wooden door of the portal, by Antonio Bencivenni from Mercatello, of which only the four upper panels remain today. The church follows the plan of the Latin cross, with a nave and two aisles. Bonifacio VIII allegedly had a second aisle on one side, commonly known as “La navatina”. The counter-façade is occupied by a giant fresco depicting the Universal Judgment by Ferraù Faenzone, a work commissioned by Cardinal Angelo Cesi, in which the influence, if nowhere near the genius, of Michaelangelo is easily discerned. The choir includes the Gothic altar and a magnificent wooden choir-enclosure (1521) with two floors. An important art piece is a 13th century Crucifixion of Umbrian school. The Palazzo del Popolo “People’s Palace” is a Lombard-Gothic construction already existing in 1213, and is one of the most ancient communal palazzo in Italy. It comprises two great halls: the “Sala Grande Inferiore”, or “Sala Delle Pietre”, and the “Sala Grande Superiore”, housing the local Gallery. The “Captain’s Palace”, in Italian Gothic style, was built around 1293 and named “New Communal Palace” to differentiate it from the former one. It is on two distinct levels: the first floor housed the Justice Hall (currently, the seat of the Communal Council), with the Judges’ offices in the lower. The latter is now occupied by the City Museum, with findings and remains of Todi’s history. It includes a saddle used by Anita Garibaldi. Some rooms are frescoed with histories of the city and portraits of its most illustrious men. It is located on the southern side of the Piazza, facing the Cathedral. It began in 1293 and later enlarged as the seat of the podestà, priors and the Papal governors. The trapezoidal tower was originally lower and had Guelph merlons. The façade includes a big bronze eagle by Giovanni di Giliaccio (1347). Located at the left of the Cathedral, it was built in 1593 by Cardinal Angelo Cesi at his own expense. His crest is visible over the great portal, attributed to Vignola. The upper floors include a room frescoed by Faenzone and a gallery frescoed by Andrea Polinori in 1629.